This sample could have included many, many more - everyone from Motorhead to Karnataka, or more embellished circular designs such as The Bag Raiders or The Wilson Pickers. Solo artists also used circles, though in a less direct way - Glenn Richards, Elvis Costello, Annie Lennox, Dan Kelly... And there were also designs that, while round, were less absolute with the form, such as Gypsy & the Cat's Gilgamesh. 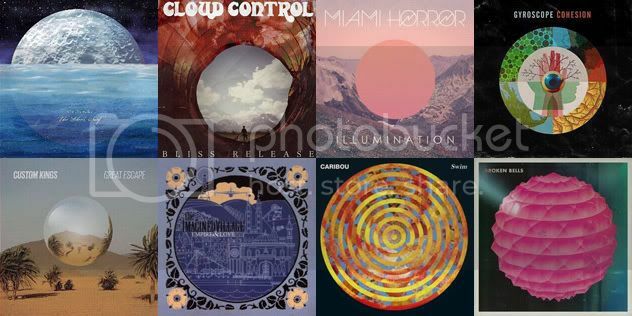 As for the music, it was a year where every kind of retro seemed to be referenced, but in inclusive and original ways, with such bands as Tame Impala and Miami Horror distilling their influences to produce thoroughly appealing and original music that held album-length magic. Tame Impala's shimmering psychedelic prog is a great listen (though I must admit the album design reminds me of Al Stewart's Time Passages). 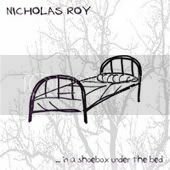 My personal favourite album of the year was undoubtedly Nicholas Roy's In a Shoebox Under the Bed, which is a model of contemporary pop/rock songwriting, full of wit, great hooks and real heart. At points I was even reminded of Kevin Gilbert, which is high praise indeed! Totally recommended - buy it! 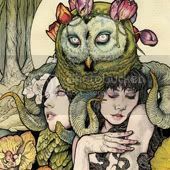 And the category of "Girls with birds in the hair" this year is clearly owned by Norwegian black metal band, Kvelertak, for their self-titled album.